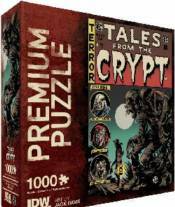 Piece together this challenging 1000-piece collector's puzzle featuring one of the most iconic horror comics covers ever, Tales from the Crypt #46, by Jack Davis with updated colors by Jay Fotos. Made in the USA from 100% recycled materials, IDW Games puzzles are built to last and suitable for framing. Art from the legendary Jack Davis! 1000 snug fit pieces! Made in the USA from recycled materials! TWINS OF EVIL (HAMMER HORROR) WALLY WOOD THUNDER AGENTS ARTIST EDITION PORTFOLIO ED.